The flooding that just struck the middle part of the country was the worst blow to U.S. farmers in decades, but now the National Weather Service is telling us that it was just “a preview of what we expect throughout the rest of the spring”. Can that possibly be true? After the immense devastation that we have already witnessed, how much worse can the flooding possibly get? Already we have seen thousands of homes and farms be completely destroyed, and we are being told that the total economic damage is in the billions of dollars. Sadly, the truth is that a lot worse is still yet to come. Thanks to a very snowy winter, a massive amount of snow is going to melt during the next several weeks, and that alone would produce tremendous flooding. But on top of all of that melting snow, forecasters are telling us that it will be a very rainy spring. 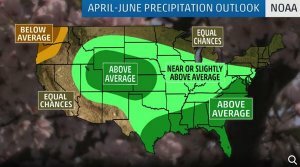 In fact, the Weather Channel is warning that there will be “above-average precipitation across much of the Lower 48” over the next three months, and one meteorologist is forecasting that it is “not looking like we are going to see any dry stretches anytime soon”. And this is on top of all of the very heavy rainfall that has been falling in recent weeks. At this point, the Mississippi River basin has already gotten “three times as much rainfall as in a normal year”. Even without any additional flooding, U.S. food production would be way down this year. The recent flooding is going to keep thousands of farmers from planting crops on time, and thousands of others are not going to be able to use their fields at all. But when you factor in what is going to happen over the next three months, we are talking about an agricultural disaster of unprecedented magnitude in modern American history. In the eastern Dakotas and Minnesota, more than 20 inches of snow remains on the ground. The Missouri, Ohio, and Mississippi Rivers drain the central United States, but it takes several weeks for the water to travel downstream. In the meantime, emergency officials are warning local residents to make evacuation plans as well as purchase flood insurance in certain areas. A lot of people out there seem to think that the flooding will just be isolated to the major rivers, but that is simply not true. Almost the entire eastern two-thirds of the nation should see flooding this spring, National Weather Service deputy director Mary Erickson said at a news conference on Thursday. Some 25 states are forecast to see “moderate” to “major” flooding, the weather service said. The Midwest floods are “a preview of what we expect throughout the rest of the spring,” she said. “The flooding this year could be worse than what we have seen in previous years … even worse than the historic floods we saw in 1993 and 2011,” Erickson added. This is the worst case scenario for U.S. flooding that surpasses all previous worst case scenarios. Thousands more farms will be destroyed. Billions of dollars worth of additional damage will be done to our agricultural industry. Food production is going to come up way short, and we are all going to experience tremendous pain at the supermarket as food prices skyrocket. The areas under the highest risk of moderate to major flooding, according to NOAA, are the upper, middle and lower Mississippi River basins, including the mainstem Mississippi River, Red River of the North, Great Lakes, eastern Missouri River, lower Ohio River, lower Cumberland River and Tennessee River basins. U.S. farmers have already lost millions upon millions of bushels of wheat, corn and soybeans to the flooding that has already happened. As I have repeatedly stressed, our planet is changing, weather patterns are becoming more severe, and even if they understood what is happening there is absolutely nothing that the radical environmentalists can do to stop it. We are witnessing things that we have never seen before, and “the new normal” is just going to keep getting stranger and stranger. If you live anywhere in the middle portion of the country, please take this flooding very seriously. Authorities are using apocalyptic language to describe this crisis, and they are not exaggerating the potential threat one bit. (TLB) published this article from The Most Important News (TMIN) with our thanks to Michael for the coverage.